My experiments performed from 1985 onwards demonstrated that N6-furfuryladenine, commonly known as KINETIN has powerful effects in delaying the onset of several signs of ageing in human skin fibroblasts in culture. 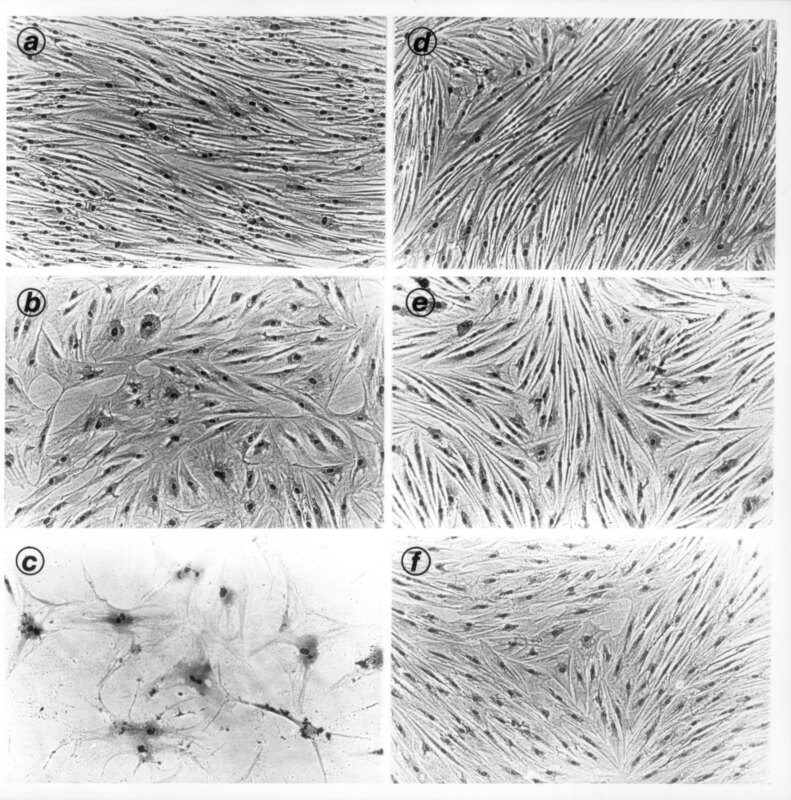 Photograph of the anti-ageing effects of kinetin in human skin fibroblasts (as published in the original research paper in Biochemical and Biophysical Research Communications (BBRC), 1994. (a-c: cells without kinetin; b-d: cells grown in the presence of kinetin throughout their lifespan in vitro). Then, in collaboration with other scientists, we reported the life prolonging and antioxidative enzyme stimulating effects of kinetin on fruitflies. Later on, our work established the natural occurrence of kinetin in plant extracts and in DNA from various sources, including human cells. We have also reported the protective effects of kinetin against DNA damage due to free radicals, and protein damage due to sugars. Other scientists have reported several other effects of kinetin, such as anti-thrombotic effects, skin whitening effects, RNA missplicing correction effects etc. 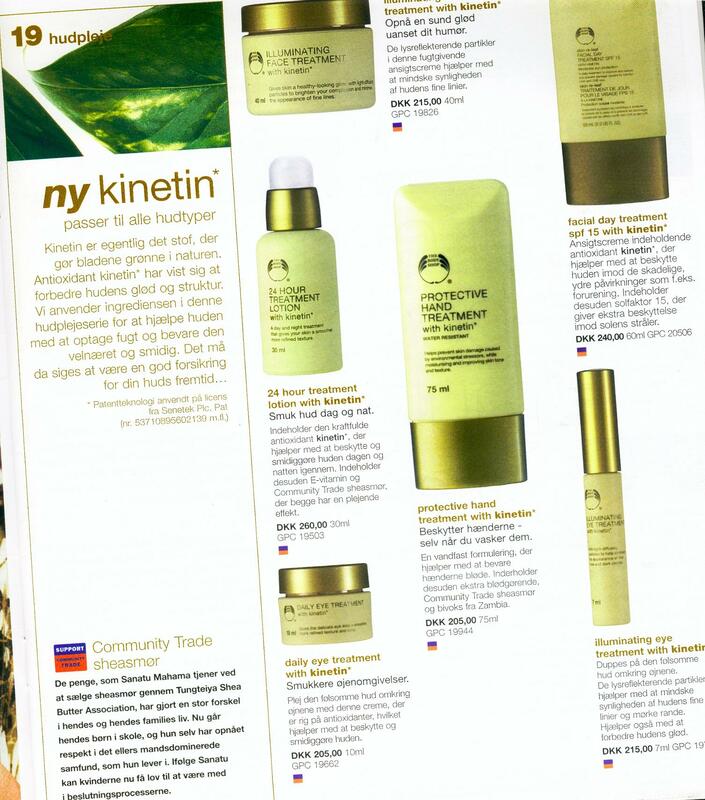 Kinetin is now a component of several skin care cosmetics and cosmeceuticals produced in several countries all around the world. It has the potential to be developed into various other health care products in the form of nutritional supplements, eye wash anti-cataract agent, antithrombotic agent etc. Then, we have also reported the anti-aging effects of zeatin (another cytokinin) on long term cultures of human skin fibroblasts. Major producers of kinetin- and zeatin-based skin care products are/have been Valeant, Body Shop, Revlon, Ferrosan, and others. For further details on kinetin and other anti-aging cytokinins etc, please contact Senetek PLC who carry the rights of use. Title: Method and composition for ameliorating the adverse effects of aging. Patents granted in several countries, since 1994, including those in North and South America, Asia, Europe etc. 16. Berge, U., Kristensen, P. and Rattan, S.I.S. Hormetic modulation of differentiation of normal human epidermal keratinocytes undergoing replicative senescence in vitro. Experimental Gerontology, 43: 658-662, 2008. (this paper demonstrates that kinetin is a hormetin by insuding the synthesis of heat shock protein, Hsp70). (#11), 45-47, 2001. (in Danish) (a review article on the biological properties of kinetin). 14. Rattan, S.I.S. N6-furfuryladenine or kinetin as an anti-aging molecule. Journal of Anti-Aging Medicine, 4, 2002. (a review article on the biological properties of kinetin). 13. Barciszweski, J., Siboska, G., Rattan, S.I.S. & Clark, B.F.C. Occurrence, biosynthesis and properties of kinetin (N6-furfuryladenine). Plant Growth Regulation, 32, 257-265, 2000. (a review article on the biolchemical identification and properties of kinetin). 12. Barciszweski, J., Siboska, G., Clark, B.F.C & Rattan, S.I.S. Cytokinin formation by oxidative metabolism. Journal of Plant Physiology, 157, 587-588, 2000. (a review article on the biochemical pathways of synthesis of kinetin). 11. Verbeke, P., Siboska, G.E., Clark, B.F.C. & Rattan, S.I.S. Kinetin inhibits protein oxidation and glycoxidation in vitro. Biochemical and Biophysical Research Communications, 276, 1265-1270, 2000. (a research paper showing the protein-protection property of kinetin, with possible implications for cataract prevention etc). 10. Olsen, A., Siboska, G.E., Clark, B.F.C. and Rattan, S.I.S. N6-furfuryladenine, kinetin, protects against Fenton reaction-mediated oxidative damage to DNA. Biochemical and Biophysical Research Communications, 265: 499-502, 1999. (a research paper showing the DNA-protection property of kinetin, with possible implications against cancer and ageing). 9. Barciszewski, J., Barciszewska, M., Siboska, G., Rattan, S.I.S. and Clark, B.F.C. Some unusual nucleic acid bases are products of hydroxyl radical oxidation of DNA and RNA. Molecular Biology Reports, 26, 31-38, 1999. (a research paper showing the molecular pathways of formation of kinetin in cells). 8. Barciszewski, J., Rattan, S.I.S., Siboska, G. and Clark, B.F.C. Kinetin – 45 years on. Plant Science, 148, 37-45, 1999. (an extensive review article on the history and novel properties of kinetin). 7. Sharma, S.P., Kaur, J. and Rattan, S.I.S.Increased longevity of kinetin-fed Zaprionus fruitflies is accompanied by their reduced fecundity and enhanced catalase activity. Biochemistry and Molecular Biology International, 41, 869-875, 1997. (a research paper showing the anti-ageing and life-prolonging effects of kinein on fruitflies). 6. Barciszewski, J., Siboska, G.E., Pedersen, B.O., Clark, B.F.C. and Rattan, S.I.S. Furfural, a precursor of the cytokinin hormone kinetin, and base propenals are formed by hydroxy radical damage of DNA. Biochemical and Biophysical Research Communications, 238, 317-319, 1997. (a research paper showing the molecular pathways of formation of kinetin in cells). 5. Barciszewski, J., Siboska, G.E., Pedersen, B.O., Clark, B.F.C. and Rattan, S.I.S. A mechanism for the in vivo formation of kinetin as a secondary oxidative damage product in DNA. FEBS Letters, 414, 457-460, 1997. (a research paper showing the molecular pathways of formation of kinetin in cells). 4. Barciszewski, J., Siboska, G.E., Pedersen, B.O., Clark, B.F.C. and Rattan, S.I.S. Evidence for the presence of kinetin in DNA and cell extracts. FEBS Letters, 393, 197-200, 1996. (a research paper showing the natural existence of kinetin in human and plant cells). 3. Sharma, S.P., Kaur, P. and Rattan, S.I.S.Plant growth hormone kinetin delays ageing, prolongs the lifespan and slows down development of the fruitfly Zaprionus paravittiger.Biochemical and Biophysical Research Communications, 216, 1067-1071, 1995. (a research paper showing the anti-ageing and life-prolonging effects of kinein on fruitflies). 2. Rattan, S.I.S. and Clark, B.F.C. Kinetin delays the onset of ageing characteristics in human fibroblasts. Biochemical and Biophysical Research Communications, 201, 665-672, 1994. (the famous research paper showing for the first time the anti-ageing effects of kinein on human skin fibroblasts). 1. Barciszewski, J., Otzen, D., Rattan, S.I.S. and Clark, B.F.C. Specific incorportation of kinetin into eukaryotic and prokaryotic transfer ribonucleic acid molecules. Biochemistry International, 28, 805-811, 1992. (a research paper showing that kinetin can be incorporated into tRNA). Historically, a wide variety of cosmetic formulations have been created, sold and utilized for the treatment and/or prevention of aging-related alterations, particularly the facial wrinkles. These formulations ranged from plant and animal product-based concoctions in the ancient times, to the use of serum growth factors, herbal extracts, and human fetal and cellular extracts in recent times. Generally, there was very little or no systematic scientific research performed to back up the claims made for such formulations. However, during the last two decades, this situation has been undergoing some change, and several new compounds have been scientifically tested to varying extents. In such studies, a compound is generally tested for its effects on the short-term growth and survival of mammalian (including human) cells in culture. This is often followed by its testing on animals for acute toxicity, and on a limited number of human volunteers for determining its effects on gross facial wrinkles commonly associated with sun exposure and photo-aging. Using this strategy, some of the compounds which have been shown to have some effects on reducing the photo-aging-related alterations in the skin include alphahydroxy acid (AHA), glycolic acid, vitamin A (retinoic acid or retinol), co-enzyme Q10, beta-alanyl-histidine dipeptide carnosine, and N6-furfuryladenine or kinetin. 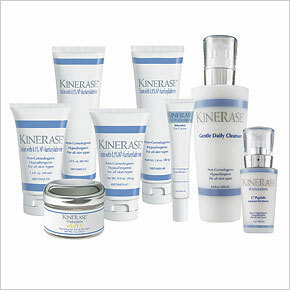 Kinetin is one of these compounds whose anti-aging effects on cultured human skin cells were first reported by us. What follows is a brief description and discussion of the chemical structure, biological effects, modes of action, and potential areas of application of kinetin in health care and anti-aging therapies. Kinetin was isolated for the first time in 1955 from autoclaved Herring sperm DNA [1, 2]. 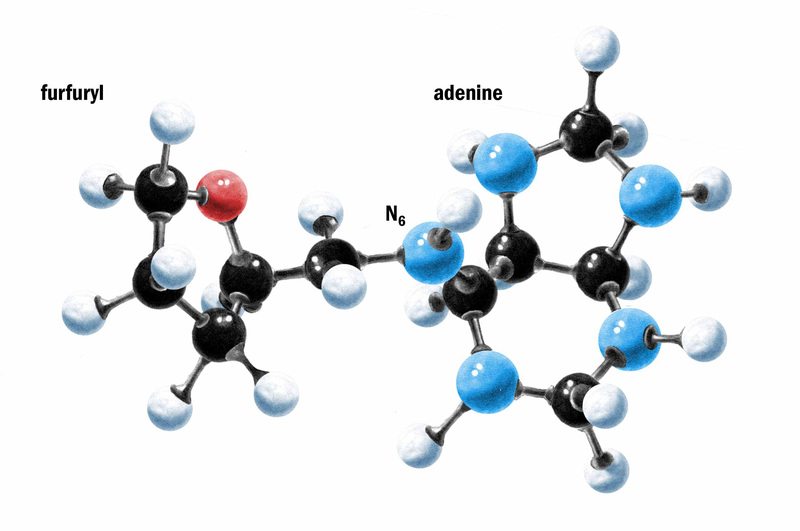 It is a derivative of adenine which is one of the nucleic acid purine bases, and belongs to the cytokinin group of plant growth hormones. Kinetin is an amphoteric compound which is soluble in strong acids, alkalis, and glacial acetic acid, is slightly soluble in ethanol, butanol, acetone and ether, but is practically insoluble in distilled water. Crystals of kinetin suitable for X-ray analysis have been obtained by slow cooling of a hot ethanol solution. Identification of kinetin in natural products was facilitated by our discovery of its electrochemical properties. The crucial evidence for the presence of N6-furfuryladenine in natural products came from our studies on the mass spectrometric analysis of DNA components [3-5]. Using these methods, kinetin has been reported to be present naturally in various plants [6, 7], and human cell extracts and DNA . The biosynthetic pathway of kinetin involves the formation of furfural during hydroxyl radical oxidation of the deoxyribose in DNA, its reaction with the exocyclic amino groups of adenine residues, followed by dehydration and reduction of the intermediates leading to formation of N6-furfuryladenine [4, 5]. It is not known if certain DNA repair enzymes then remove this modified base from the DNA and make it available as free kinetin in the cell. Data regarding the biological properties of kinetin are scattered throughout literature, often in combination with studies on the effects of other cytokinins. Most of the data for the biological properties of kinetin come from studies on its effects on plant systems. Kinetin stimulates tRNA synthesis, cell cycle progression and the catalytic activity of the cyclin-dependent kinase (cdc2) in plant cells. Low levels of kinetin stimulate calcium influx through the plasma-membrane calcium channel in plant cells. Kinetin protects plant cells against stress by suppressing cell death by viruses and toxic chemicals such as mercuric chloride. 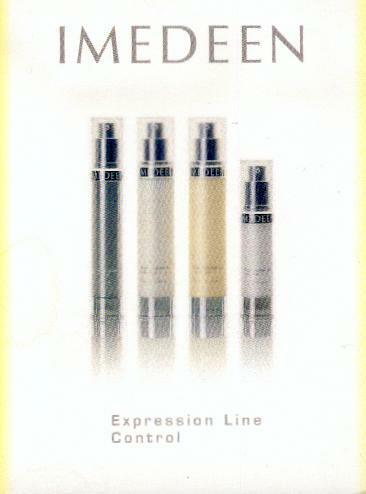 Kinetin is well known for its anti-aging effects in plants. It prevents yellowing and senescence of leaves, and slows down over-ripening and degeneration of fruits (for a recent detailed review, see ). We have reported strong anti-aging effects of kinetin on human skin cells and fruitflies. We have shown that 40-80 micromolar (approximately 10-20 ppm) kinetin delays the onset of several cellular and biochemical characteristics associated with cellular aging in long term cultures of human skin fibroblasts . Dermal fibroblasts continuously grown in culture medium supplemented with kinetin did not undergo severe morphological changes such as cell enlargement, vacuolization and irregular flattened appearance. Kinetin-treated cells did not accumulate debris associated with age-pigment lipofuscin and other oxidatively modified macromolecules. Growth of human cells in kinetin-containing medium also prevented the disorganization of the cytoskeleton and the appearance of multinuclear cells during aging in vitro. Although kinetin could slightly revert some of the age-related changes in senescent human skin cells in vitro, its effects were most pronounced as a preventive compound over a long-term treatment [9, 10]. Most importantly, treatment of human cells with the above doses of kinetin neither caused premature cell death (a sign of toxicity) nor did it induce extra cell proliferation which is a sign of potential carcinogenesis. In this respect, kinetin differs significantly from other so-called anti-aging compounds which can either cause some cell death (for example, retinol) or can promote cell proliferation (for example, serum growth factors and carnosine [11, 12]). We have also tested the effects of kinetin in combination with glycolic acid and retinol on the short-term growth, morphology and survival of human skin fibroblasts (unpublished data available with Senetek PLC). These results show that a combination of kinetin with these compounds have no adverse effects on human cells. Rather, some preliminary data indicate that kinetin may be able to neutralize some of the toxic effects of retinol observed in human cell cultures. However, this needs to be documented by further research. In order to find out the effects of kinetin on the aging and lifespan of organisms, we have performed studies using fruitflies. We have reported that 25?50 ppm kinetin added to the food of fruitflies slowed down their development and aging, and prolonged their average and maximum lifespan by 65% and 25%, respectively . Furthermore, the increase in the lifespan of kinetin-fed fruitflies was accompanied by a 55?60% increase in the activity of an antioxidant enzyme catalase, which breaks down the toxic compound hydrogen peroxide in the cells . At present, there are no studies performed on the effects of kinetin on aging, age-related pathology and longevity of mammals. In human trials for the cosmetic application of kinetin, double blind vehicle-controlled 24?48 week studies of kinetin lotions (0.01-0.1%) have been performed at the Department of Dermatology, University of California, Irvine, USA. In this study comprising 64 human subjects, twice a day topical application of kinetin on facial skin has shown consistent clinical global improvement in several photo-aging-related markers. These markers include fine wrinkles, coarse wrinkles, actinic lentigines, mottled hyperpigmentation, telangiectasia, tactile skin roughness and total water loss. The positive effects of kinetin observed on more than 95% of the test subjects were recorded without any associated negative effects such as skin burning or stinging, erythema, peeling and dryness (unpublished data available with Senetek PLC). Although the exact mechanisms of action of kinetin are yet to be revealed, various lines of evidence indicate that kinetin is involved in signal transduction and also acts as a natural antioxidant . As a signaling molecule, kinetin may stimulate other defense pathways, such as DNA repair and proteosome-mediated protein turnover. In an analysis of the antioxidative character of kinetin as a free radical scavenger one could consider two possibilities: (1) oxygen radicals can directly abstract hydrogen from the a-carbon of the amine bond of N6-furfuryladenine; or (2) they can undergo faster dismutation reaction in aqueous solution when kinetin is complexed with copper. A direct effect of kinetin on superoxide dismutase activity has been observed in plants . Our studies have shown that kinetin protects DNA from hydrogen peroxide-induced formation of mutagenic 8-oxodeoxyguanine (8-oxodG) by the Fenton reaction in vitro . Recently, we have observed that kinetin protects against oxidative and glycoxidative protein damage generated in vitro by sugars and by an iron/ascorbate system . Considering that kinetin appears to be a powerful natural antioxidant with pluripotent effects, its applications in health care and biomedicine need to be investigated thoroughly. The effects of kinetin on the prevention and treatment of those conditions occurring due to the damage to DNA (for example, cancers), and to proteins and other macromolecules resulting in the accumulation of abnormal proteins and lipids in various organs, tissues and cells (for example, cataract, maculopathy, Alzheimer’s disease and others) should be investigated. The usefulness of kinetin as a nutritional supplement in stimulating the maintenance and repair pathways in the body, and as a general molecule of defense and a component of the homeodynamic machinery also need to be explored thoroughly. 1. Miller, C.O., Skoog, F., Von Saltza, M.H. and Strong, F.M. (1955): Kinetin, a cell division factor from deoxyribonucleic acid. J. Amer. Chem. Soc. 77, 1392. 2. Miller, C.O., Skoog, F., Okumura, F.S., Von Saltza, M.H. and Strong, F.M. (1956): Isolation, structure and synthesis of kinetin, a substance promoting cell division. J. Amer. Chem. Soc. 78, 1375-1380. 3. Barciszewski, J., Siboska, G.E., Pedersen, B.O., Clark, B.F.C. and Rattan, S.I.S. (1996): Evidence for the presence of kinetin in DNA and cell extracts. FEBS Lett. 393, 197-200. 4. Barciszewski, J., Siboska, G.E., Pedersen, B.O., Clark, B.F.C. and Rattan, S.I.S. (1997): A mechanism for the in vivo formation of N6-furfuryladenine, kinetin, as a seondary oxidative damage product in DNA. FEBS Lett. 414, 457-460. 5. Barciszewski, J., Siboska, G.E., Pedersen, B.O., Clark, B.F.C. and Rattan, S.I.S. (1997): Furfural, a precursor of the cytokinin hormone kinetin, and base propenals are formed by hydroxyl radical damage of DNA. Biochem. Biophys. Res. Commun. in 238, 317-319. 6. Raman, N. and Elumalai, S. (1996): Presence of cytokinin in the root nodules of Casuarina equisetifolia. Ind. J. Exp. Biol. 34, 577-579. 7. Ratti, N. and Janardhanan, K.K. (1996): Effect on growth and cytokinin contents of palmrosa (Cymbopogon martinii var. motia) by Glomus inoculation. Ind. J. Exp. Biol. 34, 1126-1128. 8. Barciszewski, J., Rattan, S.I.S., Siboska, G. and Clark, B.F.C. (1999): Kinetin – 45 years on. Plant Sci. 148, 37-45. 9. Rattan, S.I.S. and Clark, B.F.C. (1994): Kinetin delays the onset of ageing characteristics in human fibroblasts. Biochem. Biophys. Res. Commun. 201, 665-672. 10. Rattan, S.I.S. 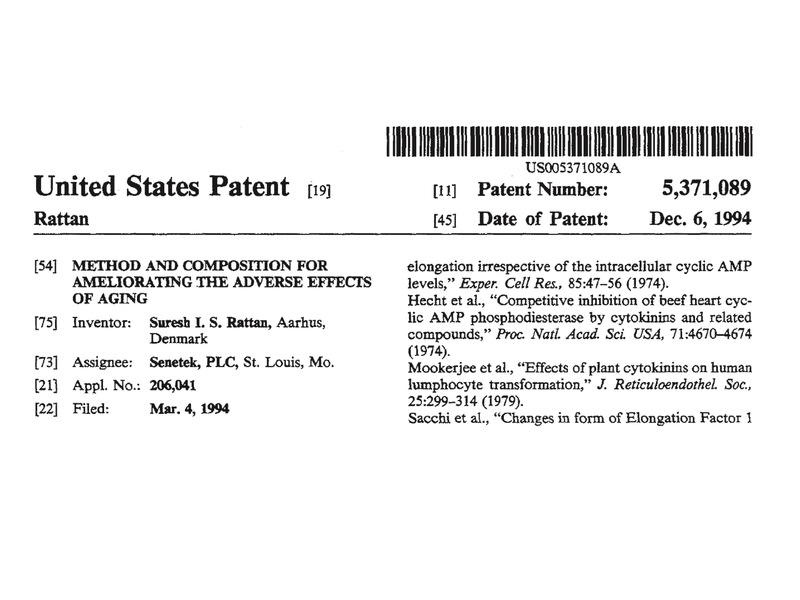 (1994): Method and composition for ameliorating the adverse effects of aging. United States Patent, No. 5,371,089. 11. McFarland, G.A. and Holliday, R. (1994): Retardation of the senescence of cultured human diploid fibroblasts by carnosine. Exp. Cell Res. 212, 167-175. 12. McFarland, G.A. and Holliday, R. (1999): Further evidence for the rejuvenating effects of the dipeptide L-carnosine on cultured human diploid fibroblasts. Exp. Gerontol. 34, 35-45. 13. Sharma, S.P., Kaur, P. and Rattan, S.I.S. (1995): Plant growth hormone kinetin delays ageing, prolongs the lifespan and slows down development of the fruitfly Zaprionus paravittiger. Biochem. Biophys. Res. Commun. 216, 1067-1071. 14. Sharma, S.P., Kaur, J. and Rattan, S.I.S. (1997): Increased longevity of kinetin-fed Zaprionus fruitflies is accompanied by their reduced fecundity and enhanced catalase activity. Biochem. Mol. Biol. Int. 41, 869-875. 15. Olsen, A., Siboska, G.E., Clark, B.F.C. and Rattan, S.I.S. (1999): N6-furfuryladenine, kinetin, protects against Fenton reaction-mediated oxidative damage to DNA. Biochem. Biophys. Res. Commun. 265, 499-502. 16. Verbeke, P., Siboska, G.E., Clark, B.F.C. and Rattan, S.I.S. (2000): Kinetin inhibits protein oxidation and glyoxidation in vitro. Biochem. Biophys. Res. Commun. 276, 1265-1270, 2000.